The Texas A&M baseball team is now the consensus No. 1 team in college baseball. Okay, outside of one poll by Perfect Game USA — a scouting site that for a time had respectable college baseball coverage with Kendall Rogers running the show but now is nowhere close to what it was a year ago — has LSU No. 1 and A&M ranked second. But beyond that, the major polls are coming up maroon and white after eight weeks of regular season play. The Aggies are coming off of a 3-1 week in which they overcame a deficit in the late innings to top Rice at home. Then, over the weekend, A&M won a close game on Friday night, dropped a one-run affair on Saturday and on Sunday (in similar fashion to the games immediately following the team’s other two losses of the season) poured it on offensively and turned an already high-scoring but close ball game into a blowout in the late innings, 13-5. A&M’s bullpen continues to be lights out, as the back-end combination of Mark Ecker and Ryan Hendrix combined to toss nine innings of shutout relief in the four games. Ecker recorded two saves; Hendrix got a win. 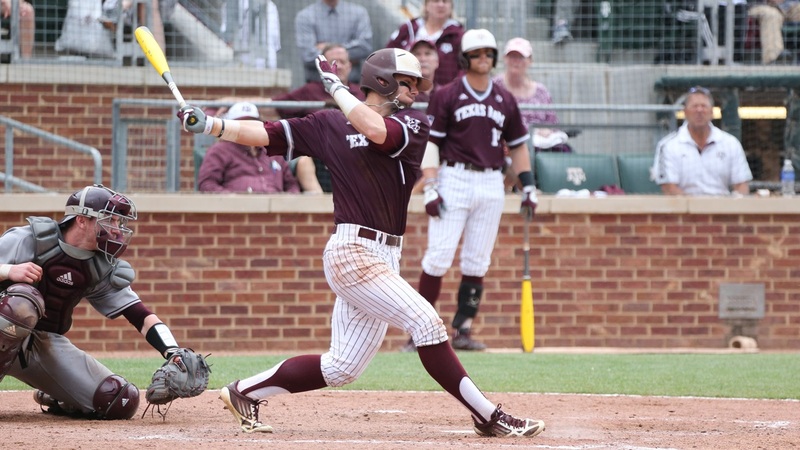 Matt Sachs, TexAgs A&M's power production at the plate (team home run leader Logan Taylor pictured) doesn't seem to be going anywhere any time soon. The pen is THE story, but the offense, and specifically the long ball, is right behind on the list of top storylines this season. 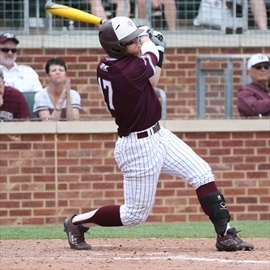 A&M is up to 42 home runs hit this season — while only allowing seven dingers thus far — and as the weather starts to heat up and the winds shift and begin blowing out of the south, that number and the rate at which the Ags are hitting balls out of the yard figures to continue to climb. The home run numbers are already much higher than many of us expected them to be this season, and the numbers in the power department continue to trend upward. 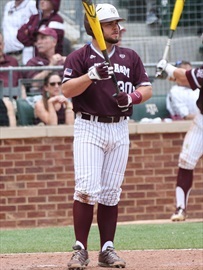 The Aggies have homered in each of the last eight games; during that span A&M has blasted 19 long balls. Keep in mind, A&M hit just 25 homers all last season. The junior hit two home runs in the series against MSU and now leads the team with eight dingers. He hit the ball hard all weekend — several times right into the glove of slick-fielding State shortstop Ryan Gridley. Nonetheless, Taylor is currently hitting .362 on the season and is two off of Ronnie Gideon’s lead in RBI with 30. RF Nick Banks got a hit in all four games last week and went 2-for-5 on Sunday with a grand slam to right center and a sharp double down the left field line, driving in four. Banks leads A&M in eight offensive categories, including average (.417), hits (55), runs (33), total bases (78) and on-base percentage (.473). DH Mitchell Nau led the team with seven hits last week, including a 3-for-3 effort vs. Rice on Tuesday. In 35 starts the senior continues to flirt with .400 (things I never thought I would say). He’s hitting .383 with a team-leading nine doubles in 2015. How can I not put 2B Ryne Birk on the “Who’s Not” list for the third straight week? The sophomore went 1-for-10 (.100) last week and is 6-for-37 (.176) combined over his last three weeks. Birk sat out the Sunday win over the Bulldogs in favor of senior Patrick McLendon, which I discussed in my writeup on Friday as something the coaching staff needed to look into. The Ags have got to get Birk hooked up once again for them to be everything they can be offensively. The order is much more dominant with Blake Allemand and Birk at the top, leading into a middle part of the lineup that consists of Nau, Banks, Taylor and Gideon. Having a guy like Gideon in the six hole and Hunter Melton in the lower third makes the order so long and so dangerous. But when one guy isn’t hitting the ball and needs to be replaced, it throws off the cohesion a great deal. It’s only a matter of time for Birk before he gets on a roll again. He’s too good of a pure hitter to stay mired in this downturn much longer. How could you separate these two ace relievers and longtime buddies? Both were simply outstanding last week. Mark Ecker tossed a clean ninth inning in the win over Rice, striking out two and looking unhittable to pick up the save. On Friday it was more of the same, though he did allow a hit and walked a batter but fought through it to pick up save number six on the season. Ryan Hendrix, meanwhile, threw two pitches and made a great defensive play to turn a double play against Rice, getting A&M out of a big jam and helping lead the comeback bid. On Saturday, he tossed two hitless and scoreless innings to keep the Bulldogs at bay, striking out three. And Hendrix was simply incredible on Sunday, recording 12 straight outs, allowing just one base hit in 4.1 scoreless innings and punching out six batters without issuing a free pass. With that, he improved to 3-0 on the mound this season. In summary, the dynamite duo combined for these numbers: 9.0 IP, two hits, no runs, one walk, 12 strikeouts. RHP Andrew Vinson continues to roll in his role of setup to Hendrix and Ecker. He worked three innings and pitched in three of the four games last week, allowing no runs on three hits. The junior struck out five and walked just one. That gives Vinson 18 strikeouts and just one walk in 22 innings this season. Grayson Long’s numbers were pretty good on Friday, but he was better than his stats would indicate. The junior allowed just one run (unearned) on three hits over seven innings, striking out four and walking two. He was in total control of the baseball game and pitched out of several jams during his outing. Just about any time it looked like MSU was on the verge of breaking out and getting to him, he would make a big pitch to get out of it unscathed. Long … wow, where would A&M be without him this season? RHP Jason Freeman. The fifth-year senior got touched up for two runs (both earned) on four hits in his one inning of work on Sunday. Not a terrible outing, but on a pitching staff that is performing quite well he is going to have to perform better when he gets his opportunity to climb on the bump and help this team. With the way the right-handed relievers have been all season long, the opportunities for Freeman have been — and likely will continue to be — few and far between. Opponents batting average: Cason Sherrod (.100) … Mark Ecker’s .111 leads pitchers with more than three innings. • It’s clear to me that there is a shift at the closer spot. At least for now, the trend is to give the ball to Ecker in the ninth if the Aggies are on top. 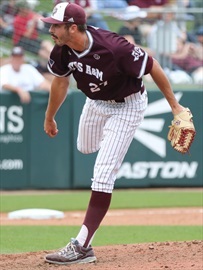 Over the past two weeks there have been several situations where Hendrix has come on in a tight spot prior to the ninth inning and each time has been able to pitch the Aggies out of jams; on several occasions, he handed the ball to Ecker for the ninth. Almost exclusively of late, when the game is on the line and the Aggies have a slim lead in the ninth, Ecker has been getting the ball. And he has done nothing but blow the doors off of opposing bats. It’s a great situation, and as Rob Childress admitted on Friday, a great “problem” to have. Though I would say it’s no problem at all. These two guys have just enough of an ego to be truly great on the mound but absolutely no selfishness or sense of entitlement when it comes to who takes the ball at the end of games. That’s part of what makes this duo so special. • Another big week ahead for the Maroon and White. Heck, they’re all big when you’re 33-3 and 11-3 in the SEC and have your sights set on a coveted top eight national seed for just the second time since the super regional format was put in place in ’99 (A&M got a top eight seed that first year in ’99). A&M hosts Abilene Christian on Wednesday night before welcoming Arkansas into Olsen Field at Blue Bell Park this weekend for a three-game series. ACU comes in with an overall record of 8-24 and an RPI of 205. These are games where you could typically see a team like A&M play down to its competition and have one of those midweek letdowns, but I don’t see that out of this team. There’s a reason why the Aggies are undefeated this season in midweek games — they don’t overlook anybody and just have fun playing the game the right way. When your approach is good and your head is in the right place, letdowns are few and far between. Arkansas is 20-16 and 7-8 in SEC play with an RPI of 79 and fighting for a top-three spot in the West. The Razorbacks are playing some of the best baseball they’ve played all season and they come into this series with a lot on the line. And with the ties between the two coaching staffs (Childress coached with Dave Van Horn at Nebraska and A&M assistants Will Bolt and Justin Seely played for Van Horn in Lincoln), you can throw the records out the door when these two teams get together. Should be a great week of baseball. I can’t remember a more fun time that I’ve personally covered the team. It’s also Parents Weekend and there are night games on Friday and Saturday, promising to make the atmosphere at Olsen as electric as it has been all season. And that, my friends, is saying something.